Why do I need an iron remover? Small amounts of iron are often found in water because of the large amount of iron present in the soil and because corrosive water will pick up iron from pipes. Clothing washed in water containing excessive iron may become stained a brownish color. The taste of beverages, such as tea and coffee, may also be affected by iron. Manganese produces a brownish color in laundered clothing, leaves black particles on fixtures and as with iron, affects the taste of beverages, including coffee and tea. 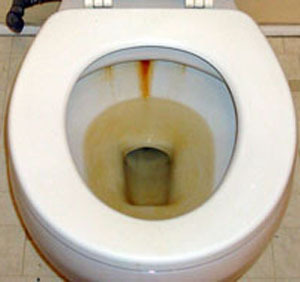 The rusty or brown stains on plumbing fixtures, fabrics, dishes, and utensils cannot be removed by soaps or detergents. Bleaches and alkaline builders (often sodium phosphate) can make the stains worse. Over time, iron deposits can build up in pressure tanks, water heaters, and pipelines, reducing the quantity and pressure of the water supply. Ferrous - This type of iron is also referred to as disolved iron is often called "clear water iron" since it is not visible in poured water. In many cases, Ferrous iron may be hard to detect at first as water is remains clear. After some time exposed to air, the water will gradually turn cloudy or a specific colour. This type of iron is found in water which contains no oxygen, such as water from deep wells or groundwater. Carbon dioxide reacts with iron in the ground to form water-soluble ferrous bicarbonate, which, in the water, produces ferrous ions (Fe++). 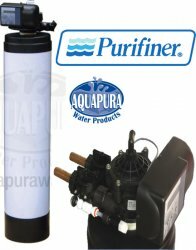 Treatment: The Canadian assembled Purifiner Air Injector Iron Filter System (PAFI) removes iron with an air injector which uses air to precipitate the iron and sulfide (sulfur) in your water. Essentially, the PAFI systems convert the iron to a solid that is filtered out with the resin in the system. The unit requires the installation of a seperate air injection valve such as the Clack PVS Air Injector or the Mazzei Air Injector. Another option for treating Ferrous iron would be the Purifiner Intermittent Air Injection Iron system (PDAF). The PDAF systems have a built in Self-Contained Air Injection that only draws in air when needed. This has it's advantage over the PAFI's continuous air injection system as there is no need to purchase and install a seperate air injection valve. In most cases, the PDAF is recommended over the PAFI system as it is a more feasible, and easier solution to removing iron. Ferric - Ferric iron is also known as particulate ion or "red water iron". This type of iron is basically ferrous iron which has been exposed to oxygen (oxidized), usually from the air. As carbon dioxide leaves the water, oxygen combines with the iron to form ferric ions (Fe+++). These oxidized particles are generally visible in poured water and often leaves an orange-brown stain or scale buildup. Treatment: Some water softeners, such as our Canadian assembled Purifiner PDS Water Softener will take out small amounts of iron in the water. If higher amounts of Ferric iron are found then one recommendation is the Pentek Iron Filter. These filters will take out iron along with sediment, bad tastes and odours. A more viable solution would be the Purifiner Micro Zeolite Iron Filter (Micro Z). The Micro Z series of iron removers act as an automatic backwashing sediment filter that removes Ferric iron. 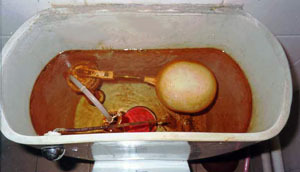 Bacterial Iron (Rotten Egg Odour) - Slime depositing in toilet tanks or fouling water filters and softeners is a good indication of the presence of bacterial iron. Better described as iron befouling, the iron bacteria problem is both complex and widespread. There are varying degrees of Bacterial Iron from minor cases, such as a yellow-brownish colour in the water, to more major cases like strong rotten egg odours or an unpleasant taste to the water. Treatment: The Purifiner Iron and hydrogren sulphide system (PDAF) treats Bacterial Iron through aeration, much like the PAFI Systems. The PDAF systems use aeration to covert the iron to solids that are filtered through the resin. The PDAF is an intermittent aeration iron removal with a built in air injector. These units are capable of treating amounts of iron in the water and are one of the best options for treating Bacterial Iron as they do not need special chemicals or a seperate air inector in order to function. The PDAF will work in most situations, however when sulfur levels are high, The PAFI systems would be a more sufficient alternative. Another option to treat bacterial iron Greensand Iron Removers are one option to attack bacterial iron. A greensand filter is formulated from a glauconite greensand which is capable of removing iron, manganese and hydrogen sulfide from water through oxidation and filtration. Manganese and soluble iron are oxidized and precipitated by contact with higher oxides of manganese on the greensand granules. The hydrogen sulfide is eliminated by oxidation to sulfate and an insoluble precipitate. When the manganese greensand bed is saturated, it is regenerated with a weak potassium permanganate solution which is rinsed down the drain. The potassium permanganate is available locally at nearly all hardware and home improvement stores. This is generally an outdated solution and only used in situations where tannins are high.